Optical Motion Technologies (OMT) were contracted to apply RDI’s Motion Amplification™ software to solve the long-running problem on 1-SCP-2. 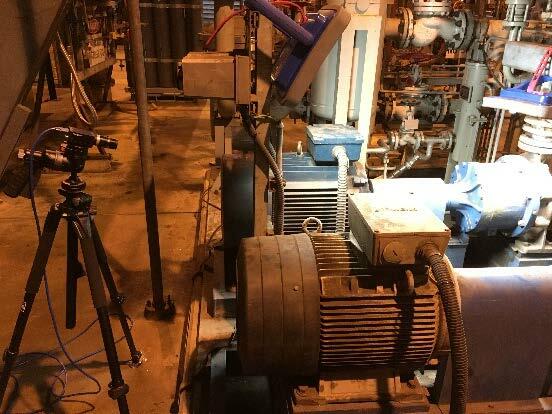 From arriving at the location of the SCPs in the power station, setting up the video camera acquisition system and then collecting nine Motion Amplification™ videos took less than one hour. This hour included the time to analyze the results all of which was done in the field. 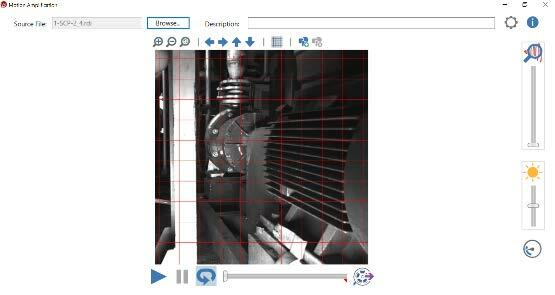 The process involved taking wide angle ‘whole of machine’ videos, analyzing them in the field and then honing in with zoomed videos on the root cause of the problem. It was clear from the videos that the problem was a soft foot condition between the pump base frame and skid base plate. In fact, there was a twisting operational deflection shape of the pump base frame. During a scheduled outage, a series of fillet welds were made across the suction end the pump base frame to the skid base plate. When the pump was returned to duty service the high lateral motion and vibration had been reduced by more than 70% and was now less than 5 mm/sec RMS. The solution to this problem was achieved through the application of RDI’s Motion Amplification™ software for a fraction of the time and cost already incurred.